The Italian M11/39 Medium Tank service life with the Italian Army was shorter than that of its production run. Thou considered by Italian standards at the time as a good design, when it participated in the Italian efforts of the North African Campaign, the 37mm Main Gun proved a problem due to it being fixed in the hull with a limited traverse of just 15° to port or starboard. The only other armament was the dual 8mm MG in the cramped hand cranked rotating turret. 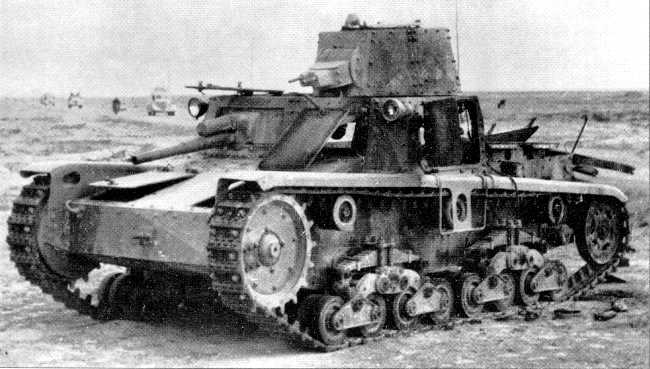 In addition to the poor gun positioning, the M11/39 had other shortcomings: its endurance and performance were both poor, it was relatively slow, its mechanical reliability was very poor, and its 30 mm maximum riveted steel armour, designed to withstand only 20 mm fire, was vulnerable to British 2-pounder guns at any range at which the M11/39s main gun was useful. In September 1940, M11s participated in the Italian invasion of Egypt. In December 1940, M11s also operated defensively in the opening stages of the British counter-offensive, Operation Compass. The British used Matilda tanks, whose armour the M11’s guns couldn’t penetrate. A few captured M11s were adopted by the 6th Australian Division Cavalry Regiment. They painted large white kangaroo symbols on the tanks to clearly identify them, until they ran out of diesel fuel. The tanks were then destroyed to prevent re-use by advancing Axis forces in the spring of 1941.